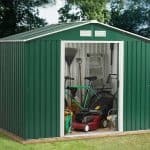 Sometimes a garden needs a compact storage facility that won’t look too obtrusive, and that’s why we feel this low metal shed is an ideal choice for many consumers. It’s low roof means that you have to bend down to gain access to the interior, but it also means that it won’t stand out above the height of a fence, and this in itself gives it added security particularly when combined with its window free design. The pent roof ensures that water isn’t allowed to collect on a flat surface, and this is just one of the shed’s defences against rain and snow. The high tensile metal cladding has been hot dip galvanised, giving it extra toughness and ensuring that rain can’t penetrate to the steel itself. That’s why the manufacturer’s have been able to supply a very generous 20 year warranty against perforation caused by rust, which is much more than we usually see when reviewing sheds in this price range. Because of its size, we found this shed very easy to install with two people working on it. It was a little disappointing that the screws required for fixing the shed to a concrete surface weren’t included as standard, but it was good to see that two separate foundation kits were available, allowing the customer to decide whether they preferred a concrete or wooden floor. This is the lowest roofed shed that Shed Baron sell, and its overall size and height was the first thing that struck us. It’s very compact, but this in itself isn’t necessarily a negative. 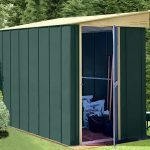 In fact, we think this would be ideal for people who want a shed for a small garden, or even to put on a balcony or patio area, possibly in a caravan park. 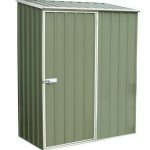 The federation green and cream colour scheme contrasts nicely, making this a very eye catching metal storage shed. We liked that the pent roof has a more pronounced slope than some, as this makes it difficult for snow to hold onto it in winter. The ridge height of the shed is 1.42m, with an eaves height of 1.2m, so obviously it’s not a shed that you’re going to be able to walk around in. It has an overall width of 1.71m, and an overall depth of 1.13m, so your concrete base must be at least this size. During construction we noticed that, even allowing for its size, the cladding was very lightweight. This is because the steel has a base metal thickness of just 0.25mm. We were a little concerned as to how stable the structure would be once assembled, but we found that the strength and stability was helped greatly by the galvanisation process which adds toughening and water resistant zinc. The frame itself was also made of galvanised steel, but with an enhanced base metal thickness of at least 0.55mm. 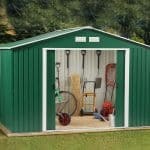 No flooring is provided, as is common with compact metal sheds, but on this occasion neither is an anchor kit to affix the shed to a concrete base. This is available as an optional extra, but as it’s really a necessity we would have liked to see it included with the shed itself. The thing which impressed us most about this shed was the lengthy manufacturer’s warranty. With a guarantee of at least 20 years against perforation caused by rust, it really does add value for the customer, especially as we’ve seen similar sheds carrying warranties of just 10 years. No treatment is required, other than keeping the shed clean and free from algae. The double doors of this shed really stood out for us, for two reasons. One was the contrasting colour, creating a two tone effect with the dark green around it. The other noticeable feature was its size. While the width is reasonable, measuring 0.69m, the door height is 1.14m, or under four feet tall. 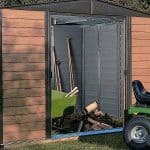 You’ll certainly have to bend to access the shed, and it may be difficult getting taller objects in and out, although there shouldn’t be a problem with items such as a lawn mower. There is no window in this shed, but tiny holes in the face of the shed provide ventilation. The lack of windows, and the low height, both help give this shed the extra security that comes from privacy. It’s easy to hide this shed out of sight, and even people who do see it won’t be able to ascertain what’s inside. This means that it’s less likely to be targeted by opportune thieves. No padlock is provided, so we recommend the purchase of one if you’re planning on storing anything of value inside, but the handles are holed to make it easy to attach one. If you plan on attaching your new shed to a pre-existing level concrete area, as we did, then you’ll have to purchase the set of 16 Hilti screws. 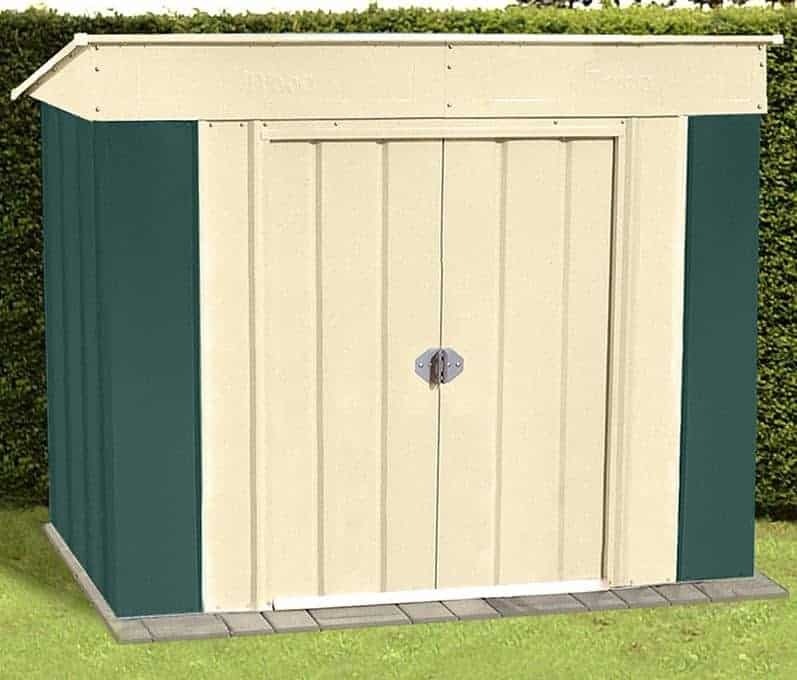 Alternatively, for £50, you can buy a 6’ X 4’ steel foundation kit which takes you through the process of creating a suitable base upon which the shed can stand. For ten pounds more, a timber floor kit is available. This allows you to utilise a wooden floor on the surface which can give extra warmth in cold conditions, as well as a more traditional feel. If you purchase this kit, you’ll have to ensure that the timber is treated with a suitable spirit or water based wood preserver on a yearly basis. We liked the fact that these items were available as options, but it does add considerably to the overall cost. We found many signs of the high quality of this shed, evidenced at first sight by the excellent paintwork inside and out. The extra thickness of the galvanised frame was also a good sign, as well as improving the shed’s stability. We’re used to metal sheds carrying 10, or occasionally, 12 year warranties, so it was good to see that Shed Baron are here confident enough to supply a 20 year warranty against perforation caused by rust. Whilst the width and depth match up to many other compact sheds, it does have a very low height and therefore a low doorway. We feel that the instructions could be a little clearer, so read through them well and have the components organised before commencing installation. It took two of us under four hours to complete the assembly. 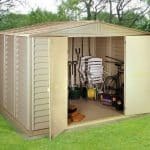 The long warranty adds to the value for money provided by this shed, although there is the added expense of Hilti screws or a floor kit to consider. Final Thoughts: Whilst this shed is one of the shortest that we’ve reviewed, this in itself shouldn’t put you off. It acts as a design feature in that it can be erected just about anywhere, and can be hidden safely behind a fence. We liked the overall look of the shed, and were particularly impressed by the quality of the components used. For such a lightweight shed, it was much stronger than we expected, and the high quality galvanised steel, along with the pent roof, are reasons why it’s guaranteed against rust damage for 20 years. This means your contents will stay dry, and you’ll get peace of mind without the need for retreatment that comes with a wooden shed.